The oldest of the group, and the great-great-grandmother of the youngest, is Mrs. Rebecca Bash, aged eighty-three years, who resides on her farm on the road leading from Davidsville to Boswell, about two miles north of the latter place. The venerable lady was born on a farm near Stoyestown and is a daughter of John and Barbara Sell, deceased. She was married to Jacob Bash in 1853. 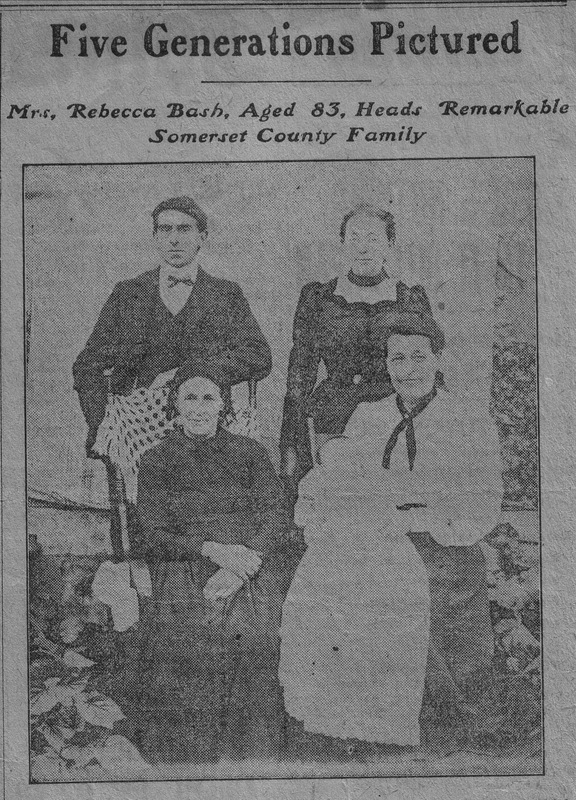 Her husband died on Apil1, 1895, but she has continued to live on the farm in Quemahoning Township, Somerset County, on which they had spent so many years. Mrs. Bash is a sister of the late George Sell, of the Eighth Ward, who lived to be over eighty years of age. The nest in line is Mrs. Jane Winters, of Somerset, a daughter of Mrs. Bash. She is pictured standing. Next comes Mrs. Winters’ daughter, Mrs. Johanna Blough, of Somerset Township, who is seated. Her son, Ira Blough, also of Somerset Township, is standind behind the chair on which his great-grandmother is seated. The five generations are completed by the baby held in the lap of Mrs. Blough. It is Ira Blough’s son Lawrence.